He loves to help. I let him put all the screws in the holes while building his last two little Ikea chairs. He still kisses his doll & all his animals constantly. One of the things he must kiss is the little cow creamer he calls Moo. He insists on pulling Moo out of the cabinet, kissing it, then putting it back & closing the door again, every day. Sprout now prefers showers to baths. Unfortunately, showering with a toddler is A LOT OF WORK, very unlike the hot, relaxing showers I prefer to have (alone) at least a few times a week. He can say the words for many colours & numbers but has no idea what they really mean. Sprout still gets a bit freaked out about floating in the pool & prefers to have his feet on the bottom, or that I hold him tight. Interestingly, he seems to understand the term fruit & uses it correctly, along with the individual names for all the ones we regularly eat: kiwi, banana, avocado, apple, orange, grape, melon, pear, strawberry, raspberry. Despite being able to correctly identify many animals, even distinguishing between such things as crows, chickens, roosters & ducks as well making as their sounds, he calls seals 'cats' when he sees them. His favourite fruit this week: watermelon. He'd eat his own weight in it if we let him. Sprout is always asking to touch things--"Tut?" --that are much higher than he can reach himself: light fixtures, ceiling fans, trees. He often asks me to turn on the wee-oh so he can dant to the music. Sprout watched his first episode of Mighty Machines Monday--it was a hit. I may have to find some more episodes online to entertain him in 'emergencies'. Hiding things continues to be a trend: this week it was his brand new toothbrush. We still haven't found the damn thing. I'm pretty sure his lower molars are getting close to coming in. I can see & feel them just below the gums, plus there have been a few times he's woken up at night inconsolable for a while, which tends to happen a while before new teeth surface. 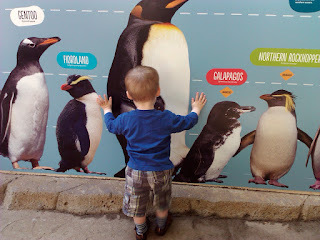 He's still not as tall as an emperor penguin.